» What are the Best Standing Desks? What makes ergonomic standing desks a great alternative to the traditional desks we’re accustomed to? Perhaps their most important feature is the ability to impose a correct posture on the users. They help you keep your back straight and your elbows at a 90 degree angle to avoid developing chronic pain. Some models can even let you transition at will between standing and sitting. They let you adjust them to your level of comfort while still providing all the workspace you need. There are many designs to choose from. To give you a better idea of what’s out there here is our top five picks of adjustable standing desks, including standing laptop desks. We also have a detailed buyer’s guide prepared, to help you understand what features to look for that can cater to your particular needs. How do you use a standing desk? What are the types of standing desk? Arranging your dream workspace can sometimes be as easy as just getting an adjustable desk frame as a starting point. The electric desk frame from Jarvis gives you a lot of freedom when it comes to desk top choices and other accessories. This desk frame can be adjusted in height between 22.25 inches to 48.75 inches. This feature makes it a solid choice also for people that want to sit down; if not all the time, at least on occasion, the top can be lowered to a comfortable height. The electric motor is not super-fast so you don’t have to worry too much about the noise it makes. What’s interesting is that it comes with the option to preset four height levels. This makes changing between them as easy as pushing a button. You can fit a table top up to 82 inches wide and 36 inches deep. The frame doesn’t come with one of its own so you are free to choose whichever wood or metal top you please. The frame also supports up to 350 lbs. which makes it quite sturdy. Height adjustable desk frame from 23.25" to 49.25"
Even though we consider the lack of a table top to be an issue, it can also be seen positively as it means you can choose the exact style of table top for your needs. With that in mind the powerful lifting capacity means you can go beyond the standard wooden table top and look to heavier materials. ​Not much really, you can still buy this product with a table top, but obviously it will increase the price. You don’t always have to replace your traditional desk in favor of a standing desk. Versa Tables offers an alternative solution with the motorized VersaDesk. This clever design can stand on top of your regular workspace and you can elevate it to your desired height with a push of a button. The maximum height of the VersaDesk is 20 inches. Keep in mind that that’s just a reference point since the actual height will be determined by how tall your current desk is. The adjustability feature is easy to use as it only takes a button push to raise or lower the height. It also doesn’t have predetermined settings so you can stop it at any height you want. The carbon steel frame gives the VersaDesk a high durability rating. It also has a scratch-free laminated table top which will help it look good for a longer time. The surface is not too slippery but you might still want to use padding under your devices. The overall design of the VersaDesk is not only ergonomic but also very practical. It has a table top that can support one monitor and a separate keyboard and mouse deck. However, you can’t stack too much on top of it since it only holds around 80 lbs. Spacious Tiers - Provides a large top tier space for monitors & laptops and a lower tier tray for your keyboard & mouse. Electric Powered - Adjust your desk riser from a sitting to a standing position in seconds. With fully electric power and no stopping points, you can adjust the riser to whatever position fits your workspace best with ease and comfort. Height is adjustable up to 20". Ergonomic Design and Movement - With the push of a button, our desk riser moves up or down quickly & easily and with no predetermined stopping points, you can adjust the height to your personal preference. 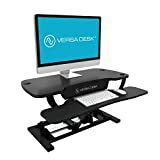 The absolute best thing about the VersaDesk is that you can put it on an existing desk, and the size makes it quite portable should you change rooms or building. It's also really easy to use with a simple button interface and it's quite quick to lift up to the correct height. If you're just looking for a desk for a monitor and keyboard and a few odd sna ends, the VersaDesk is great. If, like me, you prefer to use you desk for other activities then you will likely find the VersaDesk to be a little bit limited space wise. As well as that the lift power of the desk is quite poor at only 80lbs. Low lift capacity of 80 lbs. This tiny workstation is both creative and practical. You can put it on top of your old desk in your office or at home. It lets you choose whenever you want to sit or stand and it comes with plenty of room for the most common devices. The maximum height this desk reaches is 17.5 inches. It only takes about three seconds for the lifting mechanism to reach full extension. Make sure that you don’t have more than 35 lbs. on the table top when you do this. It’s always nice to have a product ready to use out of the box. 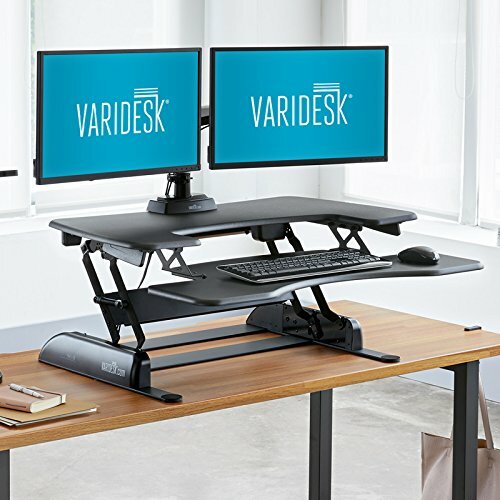 As it is with most desk risers, the VariDesk Pro Plus 36 doesn’t require any assembly on your part. You can just place it on your desk and pull the top deck as high as you want it to be. 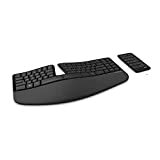 The framework allows the keyboard deck to be adjustable along with the main deck. The table top has enough space for two monitors or a monitor and a laptop. Because it doesn’t have a motor, you don’t need to worry about noise levels. It will take a long time before the high-quality spring mechanism shows signs of screeching. ERGONOMIC MOVEMENT: Our special rowing-lift raising mechanism with its up-and-back movement allows you to use the power from your lower half - leaving your back in a neutral state/healthy posture/straight and strong. QUALITY: Built with a heavy, weighted base and high-quality materials so it remains sturdy and stable at any of its 11 height settings. The patented, spring-loaded lift was designed and tested for your safety and ease. The speed of the VariDesk is impressive. Because it doesn't use a motor, the desk can be extended to full height in about 3 seconds - when you want to stay in the zone but sit or stand, speed is important! The style of this desk extension also means that it comes fully assembled so no need to spend time swearing at bad installation instructions! The biggest drawback is the weight allowance as it's only a measly 35lbs, much lower than most of it's competitors. You don’t have to rely on strength or electricity to adjust the Eureka Ergonomic sit-stand desk to your liking. The solid framework allows you to set two monitors on top and have enough room for a laptop on the lower deck. All of this is achieved while taking up minimal space. 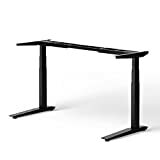 This desk riser model can extend up to 20 inches in height with minimal effort. It doesn’t make any noise as it doesn’t rely on a motor. You won’t have to make an effort to lift the top deck either, but you might want to limit the weight to 35lb. The display surface can hold two monitors side by side or two connected monitors in the middle. You have a 36-inch wide table top to work with. The lower deck, which can be used for a laptop or keyboard and mouse, is 16 inches wide and 22 inches deep. This can also be adjusted at the same time as the top desk in one motion. 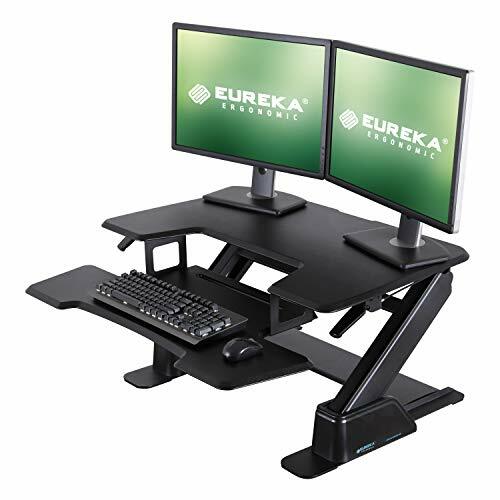 The durability of the Eureka Ergonomic standing desk comes from its steel framework and solid MDF table top and deck. 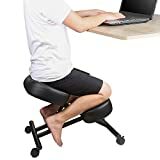 They might not support a lot of weight but they are sturdy and provide a stable working surface for both seated and standing positions. Eureka's ergonomic sit-stand desk is a proper work horse of a desk which is ideal if you tend to change your sit/stand position quite often. It's reach and dual monitor support is also excellent for the price range. As with other desks of this type, this model suffers from a low lift weight (35 lbs), which is unfortunate. Low lift capacity of 35 lb. The Executive Standing Desk Converter by Eaglestand has a simple design reminiscent of a small coffee table once fully extended. It uses its table top to maximum efficiency by providing enough space for all devices. Fully extended, this desk converter reaches 16 inches. The maximum lift capacity is 20lb but once it is fixed the table can hold up to 30 lbs. The lifting mechanism is smooth and easy to use, requiring no extraordinary feats of upper body strength. The design is stylish but also very durable. The steel frame is very stable and metal is used to reinforce the edges of the table top. The actual work space available is 32 inches wide and 22 inches deep. 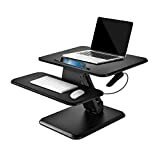 This gives you the ability to keep one or two monitors on the table top along with your laptop, mouse, keyboard, and phone. The surface is not scratch free but it is not slippery either which means you don’t need extra padding to keep your devices and accessories in a stable position. 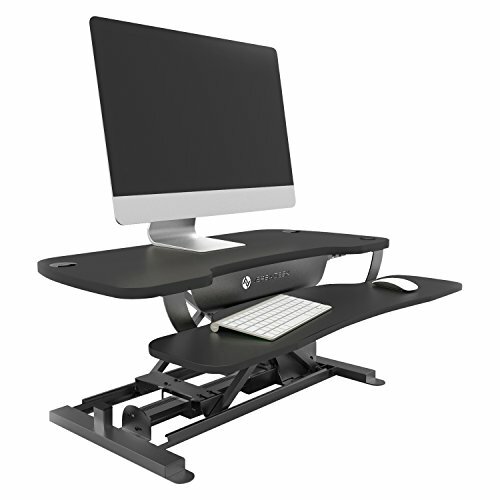 WHILE OTHER STANDING DESK CONVERTERS are too small, too unstable or simply break after a few uses, the Eaglestand 'Executive' Standing Desk converter has an extra-large surface with an improved elevation system which makes raising the table a breeze even when loaded, while preventing the unit crashing down when lowered. This means a STABLE office desk to give you PEACE OF MIND throughout your work day. 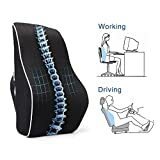 NO MORE PAIN from sitting at a desk for hours! Our ready-to-use stand up desk will free you from the agony and discomfort of back, neck or shoulder pain, leaving you CALM, RELAXED and COMFORTABLE. Whether it is the misery of sciatic nerve damage, carpal tunnel or piriformis syndrome, Eaglestand computer desks are an effective aid to a HEALTHY and BALANCED lifestyle. BE A LEADER in your workplace with this executive adjustable height table. 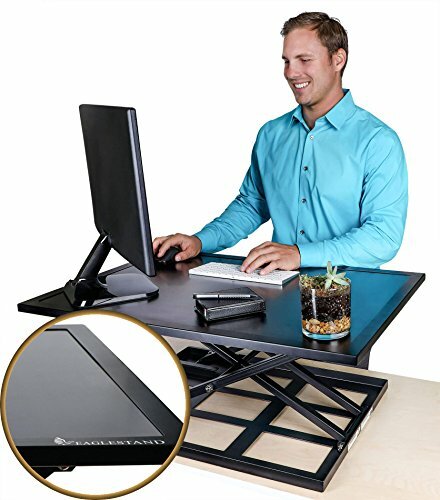 RISE ABOVE your colleagues with patent-pending metal edging on our handsome computer stand and DEMONSTRATE STEADINESS with the ROCK SOLID FRAME which makes it feel like you are working at a full desk even when fully extended or leaned on. STAND AS AN AUTHORITY for health-conscious workers with a VISION for wellness. The space saving design of this standing desk makes it ideal for people with little space, such as home offices or for students. By far the weakest in terms of lift capacity in this line up, the Eaglestand can only pump up to 20 lbs in weight, so not ideal if you have several large heavy monitors and other gear. Low lifting capacity of 20 lbs. There are many distracting features when it comes to ergonomic standing desks. Not only that, but there are also plenty of different designs to consider. It’s not always easy to decide if you should pick a budget desk or a fancy model. We have a couple of suggestions that should help you make a better decision. There are some key features that can definitely make or break a standing desk. Some you will find to be most important to you while others don’t affect you as much. Nonetheless, standing desks come in different shapes and sizes to fulfill a variety of needs and blend into any workplace environment. You can tell if a desk can cater to your needs and if it can last you a long time if you pay attention to the following key features. There is some variety in standing desk models. Some of the more popular include fixed, adjustable, and motorized desk designs. You can also find standing desk converters that act as add-ons that go on top of your regular desk to give you an elevated working area. The latter are commonly used on top of regular desks but they are not always a cheaper option despite their smaller size. Even so, they allow you to keep your old work desk and make the transition to a standing position much easier. The ergonomics behind standing desks are simple. You want a workstation that keeps your arms at a comfortable resting position. By standing you have an easier time maintaining a straight posture and thus alleviating back pain. At the same time, you maintain an optimal 30-degree line of sight angle and reduce the stress imposed on your neck. Finding a table that can be adjusted in height is very convenient. Standing desks come at different height levels but you can’t expect every person in an office to be the same size. These desks are designed to be comfortable so having everything on them within reach is essential. An added benefit of adjustable height standing desks is that they allow you to sit down from time to time and rest your legs. Furthermore, they can be used by multiple individuals regardless of their preference. With just a few pulls you can turn a colleague’s regular desk into a standing model and vice versa. Some desks can be adjusted in more than just height. Many desk designs implement multiple shelves, compartments and plenty of ingenuity to make the most out of your vertical office space. These options are great if you often use multiple devices but you don’t want them in a big pile on your main workspace. There are many factors that determine the overall quality of a standing desk. Whether you’re shopping for fixed or adjustable desks, make sure they are made of durable materials. A solid metal framework is always a good sign. If you’re planning to buy a motorized adjustable desk then you need to study up on different motor models. Don’t worry so much about the noise level but focus more on power consumption, speed and overall lift capacity. 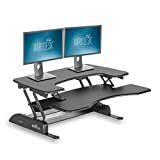 Some adjustable tables are just not built to withstand a lot of weight and may not serve you well if you need space for multiple monitors and other devices. Some people get picky when it comes to the choice of wood or finishing. Don’t dwell on that too much. No matter how polished and stain-free a desk top is, it will only last if you are careful with how you treat it. When you’re looking at desks that have multiple shelves for keyboards, mouses, speakers and whatever else you need close by, check the sturdiness of the framework. If they wobble or use poorly designed slide-in sockets, they probably won’t last as long as you would want them to. Not under constant usage anyway. Dimensions are easy to figure out. When it comes to width and length, you just have to measure how much space you have to spare in your workplace or home office. After that you just have to find a model that fits. Keep in mind that you will need a wider desk if you want to comfortably use two monitors. Height is also subjective as not everyone benefits equally from the same desk size. A good way to figure out if a desk is right for you is to drop and relax your hands and then bend your elbow to about 90 degrees. That should be the perfect height if your arm feels rested and not pushed. Since not everyone likes to keep the monitor and the keyboard at the same level, you might prefer something a bit taller for your screen. Do keep in mind though that it is recommended to either keep the screen at your eye level or slightly lower. Really high-quality standing desks can support up to 250 lbs. Of course, you should never try to push it to the limit. While they do have the durability to hold that much, you rarely know how long they can support such a large weight. Some motorized desks can support a lot of weight but they can’t do it while you are adjusting the height. Because of this it is often recommended that you empty the desk top before working the motor to prevent overheating. Having a tidy desk is not only visually appealing but it is also less distracting, and thus allows you to be more productive at work. Some standing desks come with a decent cable management design by having strategic holes and hooks on the framework. This allows you to hide cables. If your desk doesn’t have built-in concealment features, you can always purchase a cable management box. Most models can be attached to the framework and they are used to hold all excess wiring. Some motorized standing desks can go up to 66 decibels when you are adjusting the height. That may sound annoying to a few people but keep in mind the process usually takes seconds. It’s hardly a reason not to opt for the convenience of a motorized design. Besides, once you find your sweet spot there’s little reason to adjust again. You will only be faced with noisy situations if you lower and raise the desk constantly. In the long run, doing this may also overheat and put undue stresses on the motor so it is not recommended. Not all standing desks are the same. Each one will require you to find your most comfortable position. Some people feel the need to rest on the desk while they work while others may prefer to keep their balance without the help of the desk. Truth be told, there’s no ‘best way’ of using a standing desk. The only thing that should concern you is finding a desk size that fits you. This means that either the desk lets you reach everything comfortably or it can be adjusted to your liking. The point of standing desks is to be just as comfortable as regular desks while providing some extra health benefits. If you keep the monitors at eye level and you don’t have to over-reach or bend too much to reach the keyboard, mouse or pen, then you are using it right. A standing desk is a desk constructed to be taller than your traditional office furniture. It can hold everything a regular desk could and sometimes even more. Some come with additional shelves or compartments. This type of desk is offered as an alternative for people that work long office hours and have a sedentary work environment or lifestyle. They are crafted to be fully functional without having to use a chair. All your devices and equipment can be kept at close reach at a height well above your waist. Standing desks can reduce the chances of getting chronic back pain. They can also lower the risk of developing some heart conditions that have been linked to sedentary lifestyle. Some studies have shown that spending more time on your feet can also reduce the risk of obesity. A standing position also allows for better blood flow so it may have a positive effect on your blood sugar levels. A less discussed benefit of using a standing desk instead of a regular desk is that you can stay focused much longer. Assuming a seated position for long hours will eventually tire you out or cause you to slack off. However, standing up keeps you on your toes and allows you to be more efficient. Just remember that a full eight-hour shift of standing is not good for you either. So, every once in a while, have a seat and take some of the pressure off your legs. Standing desks have two main categories, fixed and adjustable. The latter are also split into more types such as motorized (for adjusting height automatically), regular (you raise and lower the height by hand), sit-stand (these imply that you can either bring it low enough to sit or high enough to stand without slouching). Last but not least, you have sit-stand desk risers or standing desk converters. These are small footprint desks that are adjustable and can be placed on top of your regular desk. They don’t go up more than 2-3 inches at the lowest position and rarely do they pass 20 inches when at full extension. Choosing an ergonomic standing desk is not too complicated once you know what to look for. If you need it to hold two monitors, look for models with a wider table top. If you want to switch between a seated and a standing position often, you might appreciate an ergonomic desk without a motor that buzzes a few times a day. 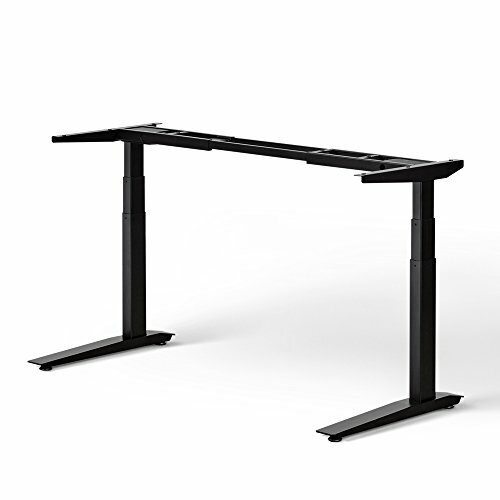 Our top recommendation is the Jarvis adjustable desk frame. Although it doesn’t come with a table top, we like the freedom to choose your own. It can reach an impressive 48.75 inches in height and hold up to 350 lbs. It offers an impressive working surface of up to 82 inches which is more than enough for two or three monitors. It does make some noise when you adjust it, but the motor is fast enough to compensate for that.